In his 11-year career, 6-time All-Star Matt Holliday has amassed an On-Base Percentage of .387 (according to Baseball-Reference.com). This is impressive, considering the league average is .340. Strengthen your eyes in 30 days. Cut the plate up into 2/3 and 1/3. Hitter focuses on either the inner OR outer 2/3’s. If the pitch crosses inner OR outer 1/3, then they take it. In games, only use approach with zero or one strike. In games with two strikes, a hitter will cover the whole plate. In games, look fastball with zero or one strike. At higher levels, like college and professional, hitters may need to look breaking ball with zero or one strike. Be flexible with the plan if the pitcher’s stats show otherwise. The players used the app for 25 minutes a day for 30 days. CLICK HERE to get the app. Right now, it’s only available on PC, MAC, and iPad. Coming soon to Android. 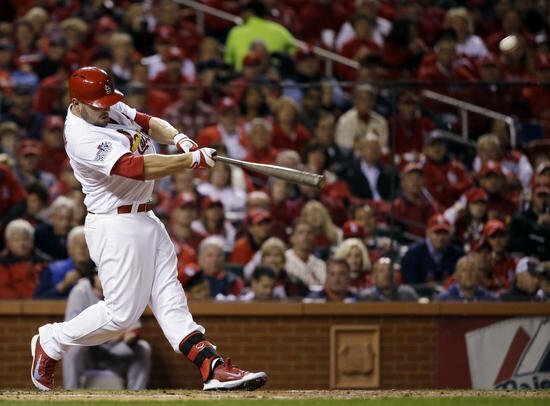 Any questions about this Part-3 Matt Holliday: The Death Of Plate Discipline article? Please post below. In case you missed Part-1 and 2 to the Vision, Tracking, and Timing video series, then CLICK HERE for Part-1, and CLICK HERE for Part-2. As coaches we need to make the distinction between ‘skill’ and ‘technique’. In this case … technique involves swinging a bat. The skill is the ability to hit a ball. Just because a person can swing a bat fast, doesn’t mean they are a skilled hitter. You need to be able to swing with control, speed, and power, and be able to connect on a ball to have a chance to become an effective hitter. You have shown that nicely with this presentation. In sports such as golf, the skill of the game comes when the player decides which club to use, determines which is the best angle to the green based on hazzards, etc., checks wind reststance … and so on. From the moment he plants his feet and addresses the ball, it’s pure technique – all necessary decisions have already been made. It’s obviously different in baseball, but that’s just another example of the skill/techinque dynamic. Thanks for the great lessons. I always find them fascinating, informative, well researched, and thought provoking. Thanks Bob, I agree. Plate discipline is a whole other can of worms. People don’t understand how skilled hitters like: Miggy, Votto, Trout, and Shin Soo Choo are (top-4 OBP in 2013, respectively) to hit with power and get on base, A LOT. They have to be self-disciplined with the strike zone. It takes practice just like working technique.